But amazement is not enough. Jesus wants to add to their amazement. He is going to take things to an even greater level. Jesus then says, “It is easier for a camel to go through the eye of a needle than for a rich man to enter the kingdom of God.” The second statement brings the disciples amazement to the next level. Mark’s Gospel says that they were even more astonished. Saying that a camel will pass through the eye of a needle is the opposite of us saying, “it’s a piece of cake.” It is a Jewish idiom for saying something is impossible which is why Jesus follows up by saying that it is impossible, for men. What the disciples hear Jesus say is that salvation is impossible for the wealthy. Later in the sermon, I added the following commentary. God can make a camel go through an eye of a needle. And God can take a human heart which is His enemy, and change that heart, so it will have faith in Christ. Saul, the Pharisee who kills Christians is an impossible convert. It is impossible for Saul to be saved. But, with God, it is possible. God changes Saul, and he becomes the Apostle Paul. All Christians are saved because God does an impossible work in the human heart. We need to thank God for His work of faith. Faith is a gift from God (Eph. 2:8). Is it an idiom Allen, or a gate? At the beginning of the year, someone shared with me a page from a website. The page, if true, contradicts what I taught. The printout (I am paraphrasing) says that most people don’t understand the verse because they don’t understand the culture of Jesus time. Jesus’ disciples will immediately recognize Jesus is referring to an actual gate in the walls of Jerusalem called “the eye of the needle gate.” The gate is very small. 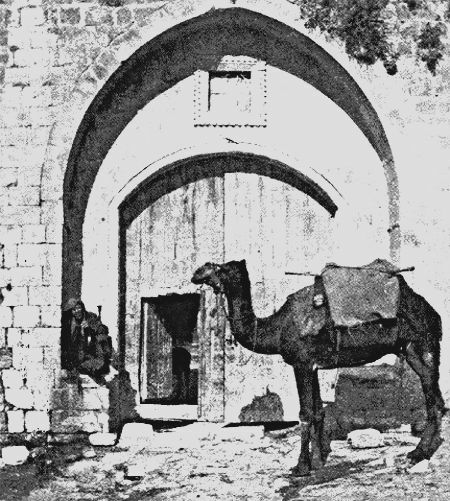 To use the gate, a traveler must unload their camel first and then carefully lead the camel through this small gate. It is a slow and quite difficult task. It is even suggested that it requires the camel to kneel, hence be humble, while going through the gate. It would be difficult for a camel to get through the gate, but not impossible. Jesus is teaching the young ruler and His disciples that he needs to disentangle himself from his wealth first just as one might unload all that was on a camel’s back to get through the eye of the needle. The belief of this gate is a common belief in Christianity that needs correction. I’ve heard about this so-called gate a few times. Here are reasons not to fall for this story and false interpretation. The “Eye of the Needle” has been claimed to be a gate in Jerusalem, which opened after the main gate was closed at night. A camel could only pass through this smaller gate if it was stooped and had its baggage removed. This story has been put forth since at least the 15th century, and possibly as far back as the 9th century. However, there is no widely accepted evidence for the existence of such a gate. Many other sources debunk the fable of the gate. It simply doesn’t exist. If there is a gate, the disciples would not be astonished, nor would they ask who can be saved because they would know. Those who want to be saved must unload their camels and tediously work their way through the gate. There is a way, and it is not impossible, just difficult. Jesus says, “With people, it is impossible, but not with God; for all things are possible with God.” If there is a gate, it is impossible for people to use it. A gate which is impossible for people to use is not a difficult gate which requires some work. It is an impossible gate. I stick with my original teaching from the message. The saying is a Jewish idiom communicating something that is impossible. I do enjoy getting feedback and talking about the Scriptures. I encourage interaction. Please keep giving feedback folks! I’ve been corrected in the past, and I am sure I will need to be corrected in the future. Here is an article telling of this falsity being perpetuated and misused and why it’s important to understand the truth.